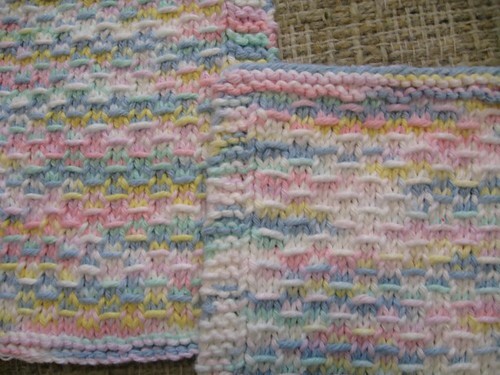 For some reason I am obsessed really into making knitted washcloths out of cotton yarn. Over the last week I have made at least eight of them for several different reasons. You may wonder why I keep making the same thing. Well, they are mindless and I can stock pile them for gifts, to use here, and well who knows. Another reason is I am stuck waiting to try a new project that I am quite excited about (log cabin) I tried to teach myself, but that did not work out too well. So I am being a good girl and patiently waiting for my teacher to come over and help me with that (HINT). Here are a few of the items that I made. 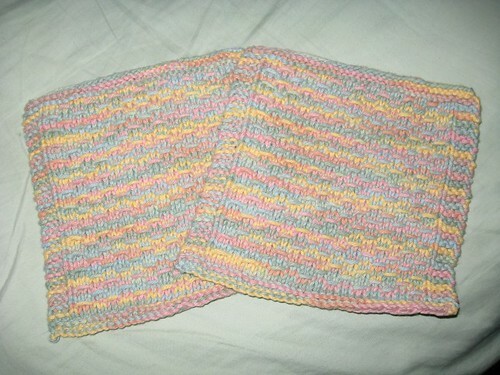 I made the following for my grandmother since she uses cloths to wash dishes. After this my friend asked me if I could help her to made some for part of a bridal shower gift. I whipped these two out in less than two days. I absolutely fell in love with these colors. 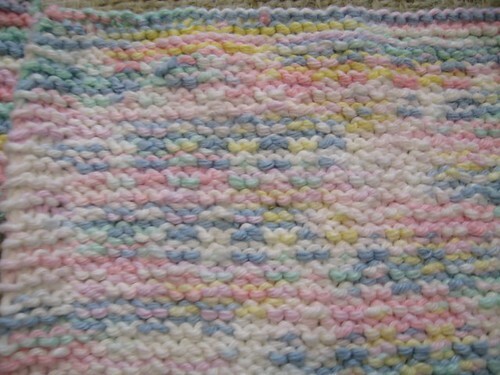 Once those were done I wanted to make some in pastels for a baby gift. 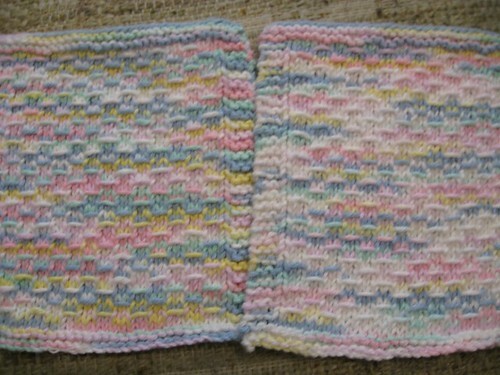 As I started the second matching washcloth from the same skein of yarn I notice there was a break in the yarn. Typically this is not an issue. Unfortunately, this was not the case this time. As you can see there is a marked difference in the colors. At the top of the second (on the right) it was bright at the top for the first 15 or so rows, then it gets very muted. When you look at the two cloths together you would think they were not only different colors, but certainly from different skeins of yarn. Not true, they were made from the same Sugar N’ Cream skein of yarn. I was quite upset and did not have time to fix this by making more. I called the company and was less than impressed with them. I still have to e-mail them the photos later on. Hopefully this was just a fluke with the yarn. I know I have a used a lot of their cotton in the past (along with Peachs & Cream) and never had a problem before. Here is the baby gift all set. On that note I feel the need to knit some before bed! 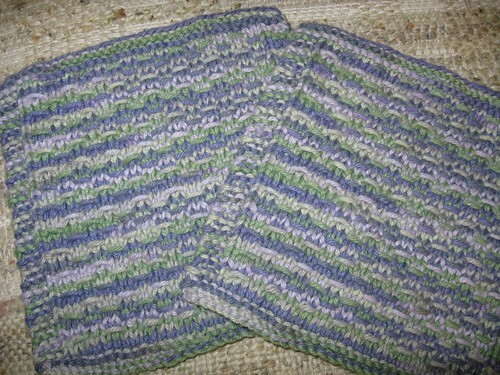 If you ever need/want any hand made knitted wash or dish cloths just let me know. Cut a girl some slack-working asscrack of dawn hours does some horrid things to your brain…stuff that coffee won’t cure! We’ll set up a time. I promise. Hopefully when Isaac goes back to school and I have a day off I can mosey on down there! Those are sooo stinkin’ cute!! Those are going to make awesome shower gifts. I’d be tempted to keep them all for myself!